This is really the only time of year you can justify sharing a good ghost story, so for the second year in a row I'm going to share my favourite ghost story of them all. This one is about a ghost named Reznikoff who haunts University College at the University of Toronto. Here's the tale as told over here. 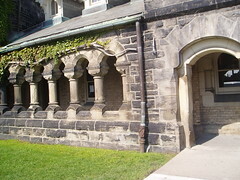 According to accounts, the ghost, "a heavy, thickset figure, with black curly hair and a beard," typically appears on the road in front of UC's main entrance or near the Roundhouse on the western side of the building. His appearances are said to indicate approaching disaster, such as a Fenian raid in 1866, and the death of two faculty members in 1892. The so-called phantom was often "seen" flitting about around Valentine's Day and Halloween. Ivan Reznikoff and Paul Diabolos were sculptors who worked on the construction of UC. Reznikoff, a muscle-bound Russian from Poland, had been saving his money and planned to marry his long-time girlfriend, but then discovered that she had been conducting a secret affair with Diabolos. A good-looking Greek from Corinth, Diabolos had somehow convinced her to steal Reznikoff's hard-earned cash and run away with him out West. Furious, Reznikoff confronted and attacked his co-worker on the UC construction site. But Diabolos, armed with a knife, killed him and dumped his body down a well. Denied a proper burial and ticked off about the whole betrayal/murder episode, Reznikoff began a long career of haunting the historic college. As legend has it, a gash in the door that leads to University College was the result of an axe swung by Reznikoff as he pursued Diabolos. Last year I revisited my old "haunting" grounds and took a couple of photos. 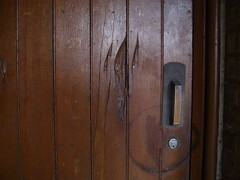 Thank you so much for the picture of the gouge in the door. You have no idea how much better you just made my project. :) I've been looking for what seems like ages for a picture of it.